The London Transport Routemaster bus - as familiar to the London panorama as Big Ben and as British as the Union Jack flag and Fish and Chips - has been named by the Government as one of the Top 10 British icons of all times. Conceived in the mid 1950's and built until the late 1960's, it was the last open platform bus to enter service in London. Although the last Routemaster has now, sadly, been taken out of service in the capital, residents in Portsmouth and the surrounding area are set to experience a little déjà vu, as Alf cruises the streets. Although designed in the 1950's Routemasters were way ahead of their time and there are some excellent, informative websites about them, compiled by enthusiasts and visited by anyone who mourns the passing of such a wonderful British icon. Portsmouth - it's better by Alf ! Think of Portsmouth and a variety of familiar symbols of the City come to mind; The Historic Dockyard, The Spinnaker Tower, Portsmouth Cathedral and now...... Alf ! 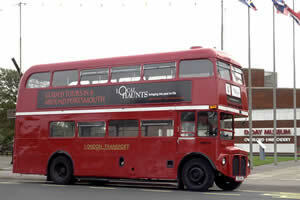 This vintage red London Bus is set to become the latest memorable sight in the city. An original 1961 vintage ex-London Transport Routemaster bus, Alf is original in build and has been lovingly restored and painted in traditional LT Central Red. Previously WLT 994, Alf is now set to become a Portsmouth icon as he transports visitors around the city taking in the sights. Once on board Alf, passengers can settle down and enjoy the Local Haunts experience, which uses fully qualified tourist guides to conduct Tours that reveal aspects of the city that people never knew existed. The tour includes the panoramic views from the top of Portsdown Hill and what better vantage point than from the comfort of a true British Icon? This is a fantastic chance to see the City from a totally different perspective; on board a symbol of London life for over 60 years. Visitors are literally stepping into history from the moment they board Alf and some passengers even recognize him from his London days! At twilight, Alf is also central to Local Haunts’ tours of the darker side of the city and he's also available for private hire, to make a wedding day, a private party or a special occasion truly memorable. So, although he's no longer working hard on the streets of London, he's enjoying a busy, happy semi-retirement in the City of Portsmouth.